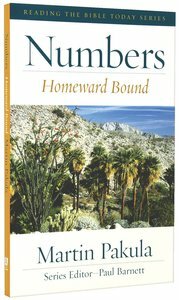 About "Numbers - Homeward Bound (Reading The Bible Today Series)"
Customer Reviews For "Numbers - Homeward Bound (Reading The Bible Today Series)"
Reading this, you can tell that Pakula is passionate about the book of Numbers, and passionate about people understanding it. He makes good NT connections and takes a sound biblical-theological approach to application (he has a Masters in Biblical Theology) which is a big positive over some of the contrived relevances to today that some popular-level OT commentaries suggest. The review questions at the end of the chapter are good and thoughtful so this commentary would also make a good Bible study with included commentary (alogn the lines of the Read, Mark Learn series for St Helen's Bishopsgate). In fact, I think that this book is best thought of as a detailed Bible study guide (for a group or individual). My one criticism of this book is that Pakula - a Christian who grew up in an orthodox Jewish family with a particular passion for the book of Numbers - seems like the perfect person to make sense of some of the more tedious passages in Numbers (lists of tribes, people, roles etc.) but he often moves quickly over a long section, or simply describes what the verses, without adding to our understanding of their significance.